1. Preheat oven to 450 degrees. In a small pot, melt half the butter. Off heat, toss in breadcrumbs and a pinch of salt. Set breadcrumbs aside. 2. Roughly chop cauliflower into 1-inch pieces. Transfer to a medium pot and add enough milk to cover cauliflower. Bring to a simmer over medium-high heat. Continue simmering, adjusting heat as needed to avoid bubbling over, until cauliflower is very tender, about 10 minutes. Strain cauliflower and return to pot, reserving cooking liquid. Set aside. 3. While cauliflower cooks, heat olive oil in a medium sauté pan over medium-low heat. Add ham and sauté until browned, about 3 minutes. 4. Transfer half the cooked cauliflower to a food processor or blender and season with salt. Add remaining butter and 1½ cups reserved cooking liquid. Puree until totally smooth, with the consistency of a béchamel (thick but pourable). If needed, blend in more cooking liquid. 5. Stir peas and ham into remaining cooked cauliflower in pot. Toss in enough puree to generously coat and bind ingredients. Season with salt and lemon juice. 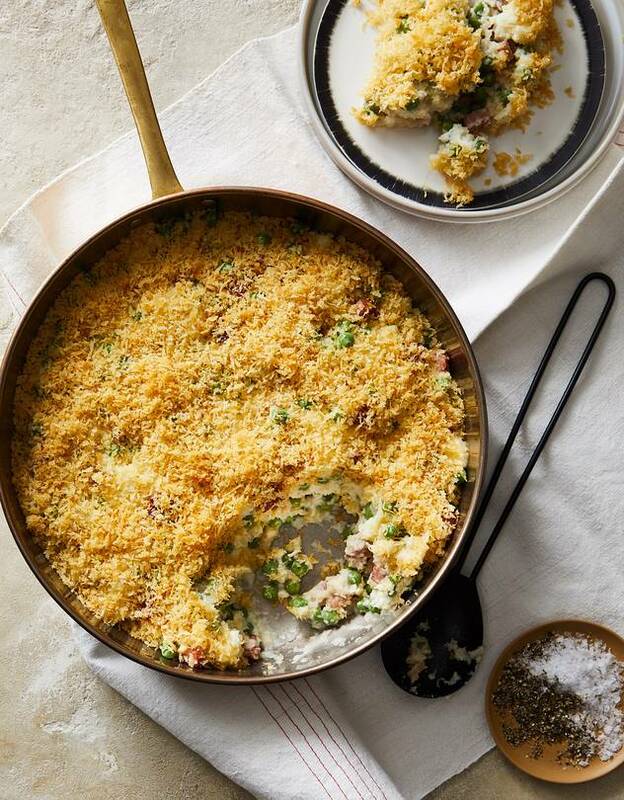 Transfer to a 10-inch baking dish and top with a thick layer of buttered breadcrumbs. Bake on middle rack until filling sets and top is golden brown, about 10 minutes.